This quick and easy one-pot meal is full of flavor and low on calories. 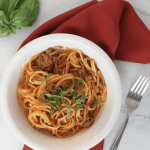 This Instant Pot pressure cooker chicken cacciatore is comfort food at its finest! 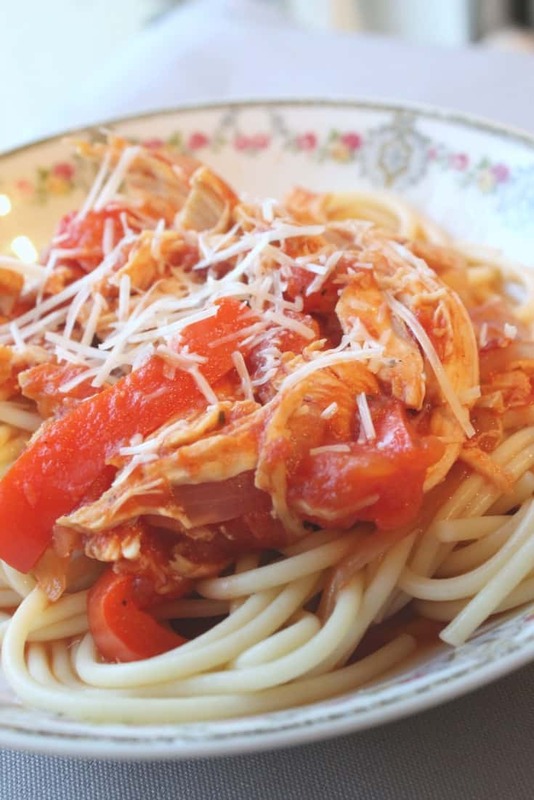 When I was growing up, chicken cacciatore was a meal my dad frequently made for dinner. He wasn’t a big cook, so he used a jarred cacciatore sauce mixed with some cooked chicken. While it wasn’t anything fancy, we all really liked it. When I grew up and began cooking for myself and my family, I tried a handful of chicken cacciatore recipes, only to be left sorely disappointed. 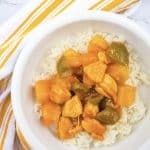 Eventually, I stumbled upon this recipe at Skinnytaste and fell in love. 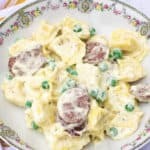 It was incredibly simple, only used a few ingredients, and was delicious comfort food. Because it was made in the slow cooker, it was an easy, hands-off recipe, which I love. However, I wanted to speed up the process a bit without losing that easy, hands-off characteristic, and certainly without sacrificing flavor. 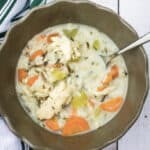 I followed these basic guidelines for converting a pressure cooker recipe to a pressure cooker recipe and was thrilled with the results! 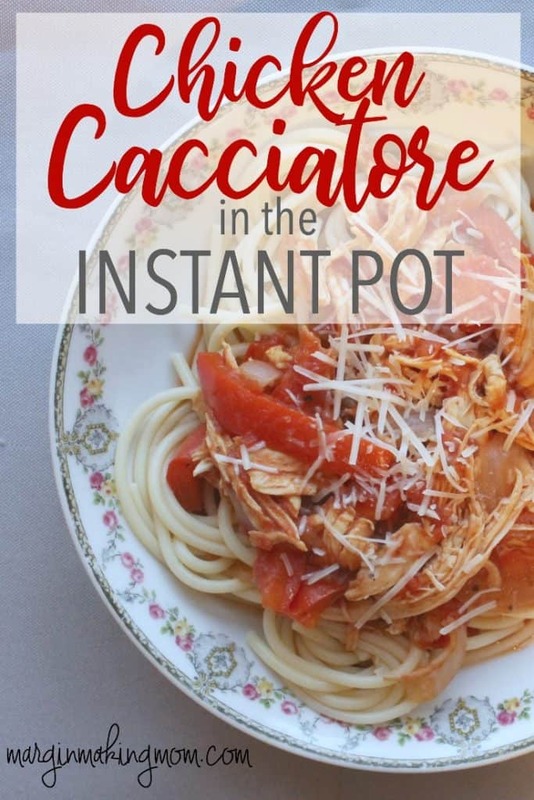 Pressure cooker chicken cacciatore made in the Instant Pot is a quick and easy one-pot meal full of flavor and low on calories. Add it to your meal plan for a fast weeknight meal! 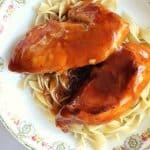 For this recipe, I use boneless chicken breasts and cut each in half to decrease the cook time. 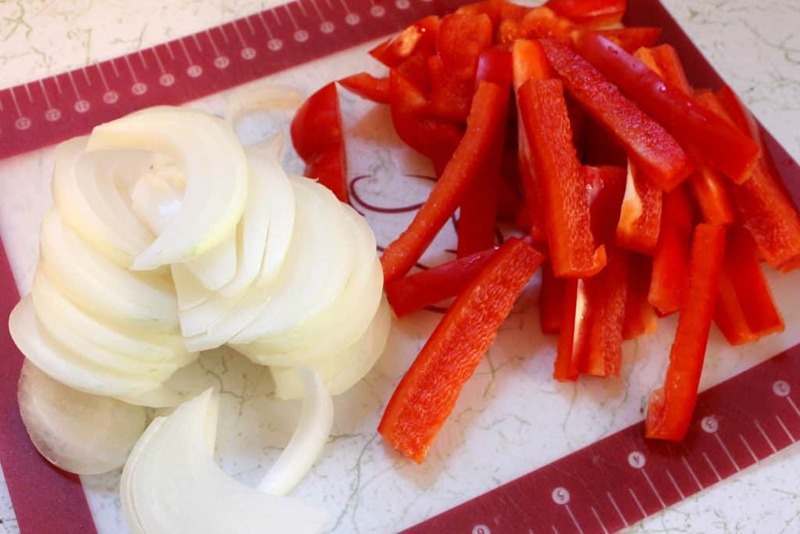 Then I slice half an onion and a whole bell pepper. 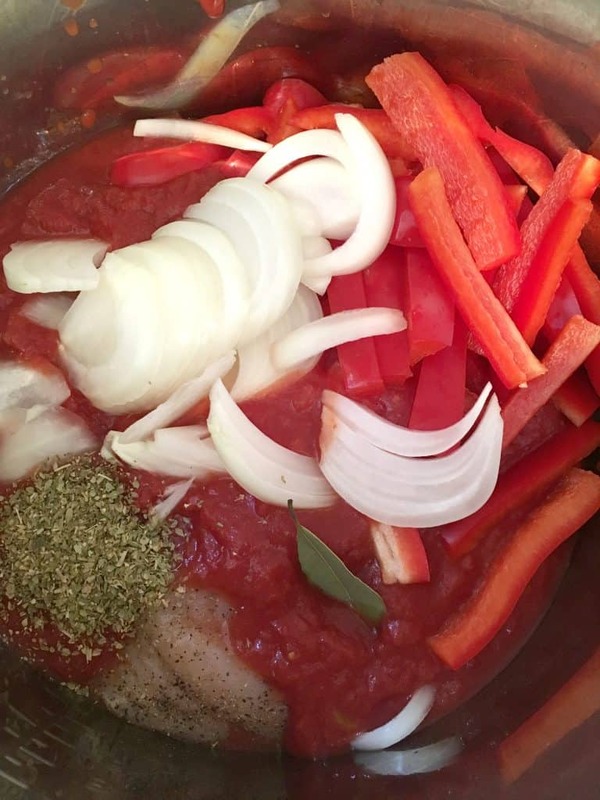 I combine the chicken, onion, bell pepper, crushed tomatoes, oregano, and bay leaf in the insert pot of the Instant Pot. Because crushed tomatoes are somewhat viscous, I add some extra water to ensure that the liquid boils (instead of scorching) to achieve pressure. I use the manual setting on the Instant Pot and select high pressure for 4 minutes. After the cook time, use a natural pressure release. Once the pressure has released and the valve has dropped, open the lid and remove the chicken for shredding. At this point, if you desire your sauce to be a little thicker, you can use the saute function of the Instant Pot to simmer the contents uncovered until the desired thickness is achieved. I usually simmer for about 15 minutes while I shred the chicken and cook the pasta. All in all, the sauce is ready in less than an hour–much faster than in the slow cooker! This sauce can be served over pasta, rice, or a low-carb option such as zucchini noodles or spaghetti squash. Top with a bit of parmesan cheese and you’re in business! 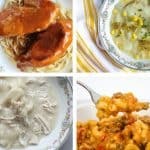 See everything you need to know about getting started with easy pressure cooker recipes here! Read about how to convert slow cooker recipes for the pressure cooker (with a FREE printable cheat sheet!) here. 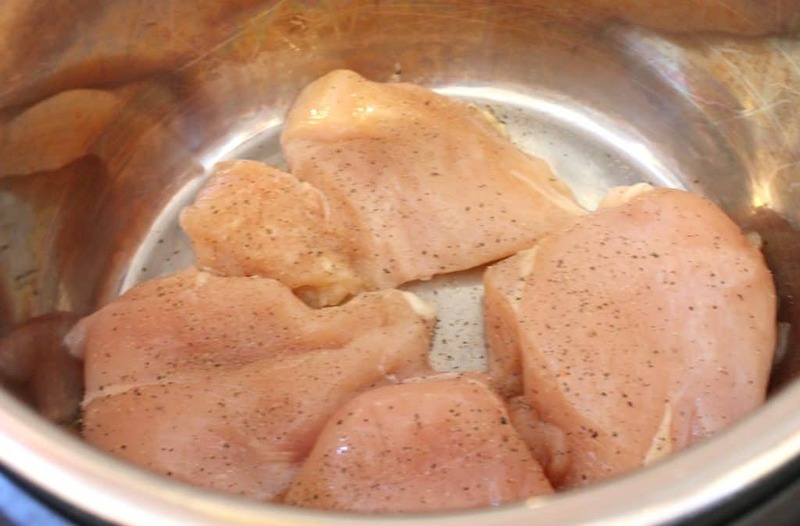 Cut each chicken breast in half. Place in insert pot of the Instant Pot. Sprinkle with salt and pepper. Add crushed tomatoes, onion, bell pepper, oregano, and bay leaf. Pour in water. Stir to combine. Use the manual setting to cook at high pressure for 4 minutes. When cook time is complete, allow a natural pressure release. When pressure has released, open lid and remove chicken for shredding. Shred chicken and return to pot. If desired, use saute setting to simmer sauce to desired thickness.